Even with a strong national economy, low unemployment and low interest rates, Americans are always subject to dealing with mortgage lenders arriving to foreclose on their homes. Housing experts say that the ease with which homebuyers, even those with bad credit, have been able to get mortgages over the years is the most common culprit of foreclosure. As a result, many buyers have overextended themselves, taking loans with unfavorable terms even when the housing market dictates extremely high price tags. Homeowners can and do beat foreclosures on their properties--but only when they act the moment they begin to experience financial difficulties. If you're going to have trouble meeting your mortgage payment, call your mortgage lender immediately. Swift action may prevent the loss of your home. Mortgage lenders will always want to work with you and help you find a way to keep your home. That's because they're in the money lending business not the real estate business. If your mortgage lender has not had a payment from you for a month or two, and if they haven't heard from you, they will assume you do not intend to pay them. In that case they will feel justified in trying to take back your house. If you are in serious financial difficulty, you should seek professional assistance and/or legal counsel to best protect your investment and your home. Before you call your lender, be ready to discuss your financial problems. They will need all the information you can give them in order to help you. Make notes about your income and outgoings so you will be better able to answer questions. It will impress the lender if you seem to be making a sincere attempt to tell the truth about your situation and get your finances under control. There are a number of ways in which your lender may be able to help. If you get in touch with a lender before you miss a payment, the lender might offer forbearance. This means they would put the soon-to-be-missed payment at the back of the loan, allowing you to skip a month and not getting a mortgage late on your credit. This is why you need to contact your lender if you've lost a job or had some other short-term setback. In fact, your lender may allow you to skip several payments and give you time to get back on your feet. Ask your lender about restructuring your loan. Since the lender knows that mortgage payments are the last payments a person will let slide they already realize you are probably having a few other financial problems. If you have some equity in your home, a lender may allow you to restructure your loan to lower the monthly payments. If you've missed some payments they may even agree to add the past amount due into the new loan. Ask your lender about helping you get a one-time payment from the government's FHA-Insurance Fund to bring your mortgage current. You may qualify if your loan is at least 4 months delinquent, but no more than 12, and you are able to begin making full mortgage payments. If your problem is so serious that it can't be resolved in a reasonable amount of time, it may be better for you to sell your home and find one with more manageable payments. In that case, sell the home, pay off both the mortgage balance and your delinquent debt, and avoid foreclosure. If you can't sell your home it may be possible to sign it over to a lender. This is considered a voluntary foreclosure and could damage your credit record. You will lose your home, but you will not be held liable if the home sells below the debt amount. The last resort, when all other options fail, is to declare bankruptcy, since foreclosure proceedings are usually stopped until a bankruptcy is resolved. This may save your home although it will damage your credit record for at least 7 years and you will lose control of your finances. John O'Mahony is a former New York Post Associate City Editor and West Coast Bureau Chief for Life&Style Weekly. He has written news, travel, business and entertainment stories for many publications including The New York Times, The New York Daily News, New York Newsday, Golf Magazine and Variety. He has also produced TV programs and promoted and managed rock concerts. O'Mahony, John. "How to Beat a Foreclosure on a Home." 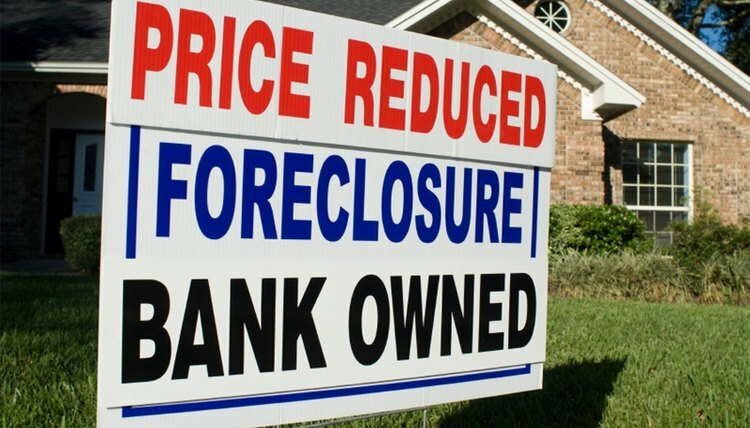 , https://legalbeagle.com/2037042-beat-foreclosure-home.html. Accessed 20 April 2019.